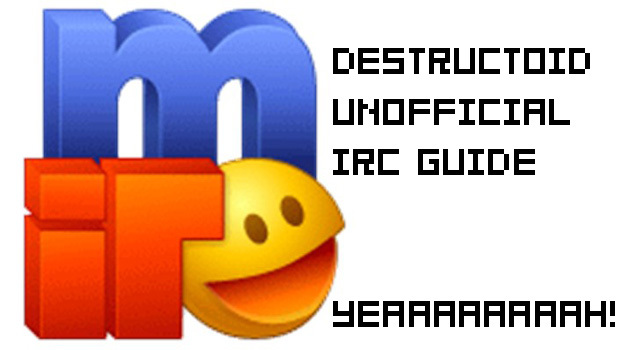 IRC has been a part of Destructoid's community interaction for almost 5 years now. Scary isn't it? It's a place where you can hang out when you're bored at work, class or just in general. It's completely unofficial, which means none of the things said on IRC reflect Destructoid in any official way. It's just all community all the time, and over the years it has even become a permanent hangout for a lot of people. But it's also kind of an ancient method of online communication that can be hard for people to get connected to. A multiplayer notepad if you will. Hence this guide to help you out! 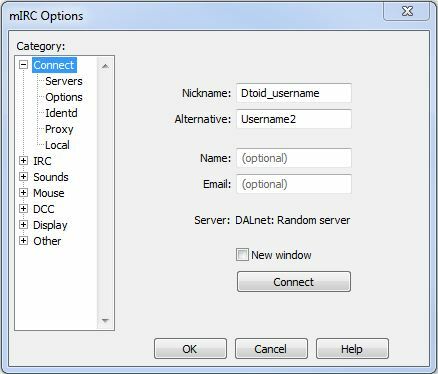 It covers how to connect with a few popular Windows and Mac programs, how to connect from within your browser, your mobile and iPad devices and a few basic rules for IRC. Windows users tend to stick with mIRC and X-Chat 2 for the most part, so we'll only cover these two in this guide. mIRC is not a completely free program, but if you don't want to pay for it you'll get a popup for a couple of seconds after the 30 day trial ends, which can be pretty easily ignored. 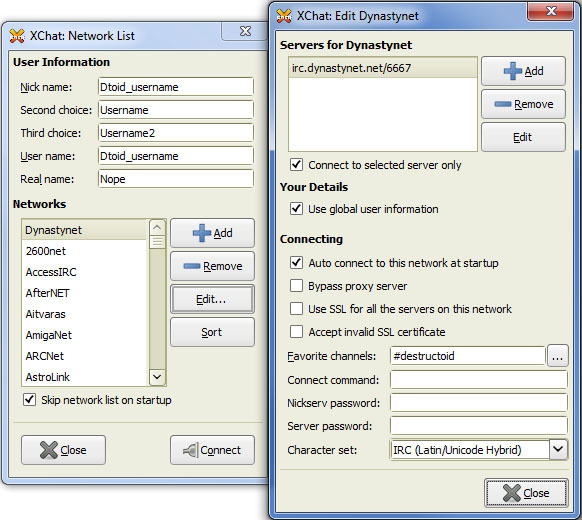 X-Chat 2 on the other side is open source client for Windows and Linux and free. First, download the client here and install it. If you don't know what the installing options mean, just click next until you are done. It doesn't install any browsers, toolbars or anything like that. Then start up mIRC! If you get a window that asks for registration things, just click Continue. Just fill in the username you use on Destructoid as your Nickname, so people know who you are. The Alternative name is in case you temporarily lose your connection for any reason and your Nickname is still in the channel when you rejoin (it can take 3 minutes for your old Nickname to time-out from the channel at times). Just name it Username2 or something else that still keeps you recognizable. Keep in mind that you can't use spaces in your name, so use underscores for that instead. Name it whatever you want in Description just so you have a reference point for the future and click OK to close this window. Then click Select at the previous window to make this your default server. Click OK again to close this window as well. You are now ready to connect to Dynastynet. But to make things easier for you for future use, let's set it up to automatically join #destructoid whenever you start up mIRC. 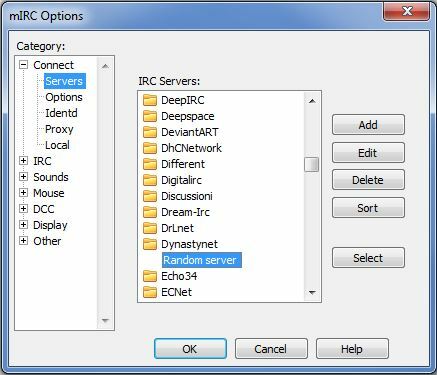 With the mIRC options window still in front of you, go to Options on the left-hand list, below Servers. Check Connect on startup which does exactly what you think it does. Uncheck Show connect on startup so you don't get to see this window again every time you start up mIRC. Now click the Perform button on the right. Perform let's you set up actions that mIRC will take whenever you connect to a server. Now just click OK to close the Perform window, and OK again at the Options window. You're all set and it's time to connect! Click the little lightning icon in the top-left, below File. You may get a Windows Firewall popup asking you to allow it. And that's it, you can now chat in #destructoid and whenever you close and start up mIRC again, it will automatically let you join the channel without any hassle. If you ever want to change anything at the Options screen again, like disabling sounds, just click the hammer icon right next to the Connect lightning icon and play around. While there is an official XChat for Windows which is shareware with a 30 day trial (just like mIRC), X-Chat 2 is still completely free. Start by downloading version 2.8.6-2 here and install it. Choose compact installation if you don't know what Python or Ruby is, because it will complain about missing DLLs. For people with other languages than English in their Regional settings in Windows: X-Chat 2 doesn't have a language change option for some reason. If it starts up in your native language and you want it in English, close the program, go to wherever you installed it and then go into the /locale folder. Delete every language folder except for en_GB and you're set. 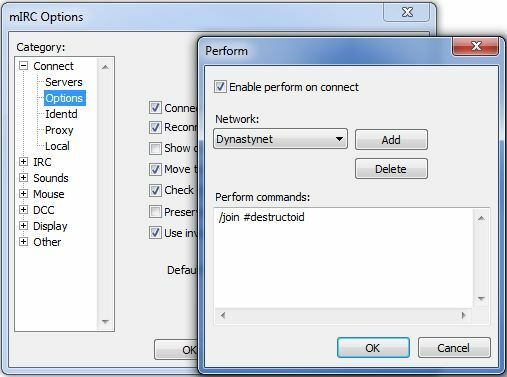 Under Networks, click Add to create a new network shortcut for Dynastynet. Name it Dynastynet or Dtoid IRC or something and press enter. Now click "Edit" to launch the window you see on the right in the example above. 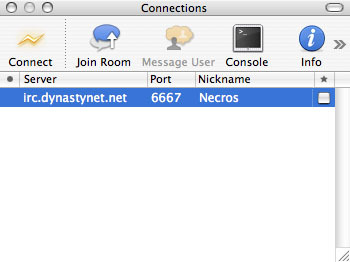 The new window will show newserver/6667. 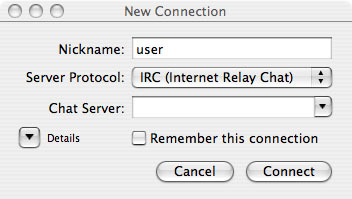 Click on this and change it to irc.dynastynet.net/6667. Check Connect to selected server only and Auto connect to this network at startup. Type #destructoid at Favorite channels. Click Close to close the Edit window. Check the Skip network list on startup box in the Network List window to skip this popup window in the future. Now click Connect at the Network List window and you are all set! It will automatically reconnect to #destructoid whenever you start the program again. Bob Muir of Japanator and Flixist fame, a.k.a. Necros, wrote most of this section for the original IRC guide, which should help you get connected on the Mac. You've got a few options with clients such as Colloquy and X-Chat Aqua, which operates in a similar manner to its Windows-based cousin. Our latest addition to the IRC family, lolshin, pointed out that Textual is another great IRC client for the Mac. I don't own a Mac so I can't help you out with this one, but it should be pretty straight forward to set up if you use Colloquy or mIRC as a reference. It's not free though ($4.99). We'll focus on Colloquy in this guide, as it's also available for iOS devices like the iPhone and iPad. 2. 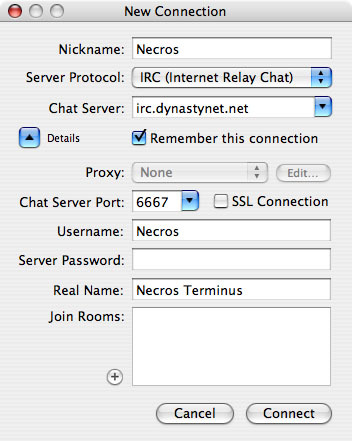 Under Chat Server, enter "irc.dynastynet.net" without the quotes. 3. Click Details. This will open the rest of the settings. 4. Check Remember this connection. 5. Under Username, enter the same thing as your Nickname, then hit Connect. 6. Your Connections screen will now have the server entered. In the upper right, click on Info. 7. At the top of this new screen, click on Automatic. 8. Check both Connect on launch and Open console on connect. 9. 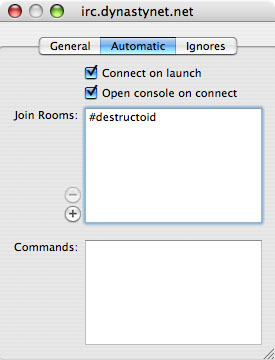 Under Join Rooms, enter "#destructoid" (no quotes), then close the window. 10. On your Connections screen, hit Connect. 12. The screen above will appear, and you're in! Click the down arrow in the side bar to see who is in the channel, then consider going to preferences to customize the appearance, which can range from iChat-like bubbles to pure old-school text. If you can't install a client because you are at school, work, or for whatever other reason, there are a couple of browser-based solutions to help you out. Mibbit is a website IRC chat which is the easiest to connect with. Chatzilla is a Firefox plugin which requires a bit more setting up, but because it opens in a separate window it can be useful if you are the type that has 100 tabs open all the time. Go to the Mibbit site. 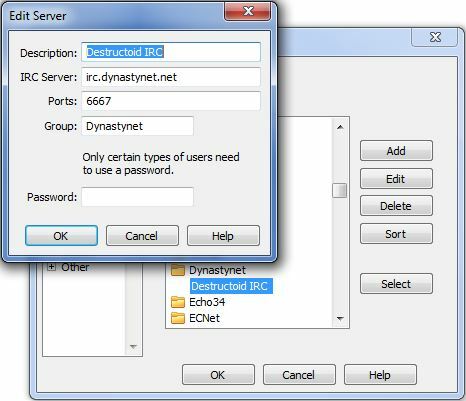 At the IRC dropdown box, select Dynastynet [webirc] (typing "e" and going one up speeds things up). Enter your nickname, type #destructoid at the Channel: box and click Go. Boom, you're in. Just fill in your nickname and #destructoid as the channel name, and you're good to go. Install the Chatzilla plugin for Firefox. Restart your browser (boo!) and open Chatzilla under Tools in Firefox. At the bottom-left, click on the button to change your nickname. Now go to Chatzilla -> Preferences in the top-left bar. Under Global Settings, go to Startup. 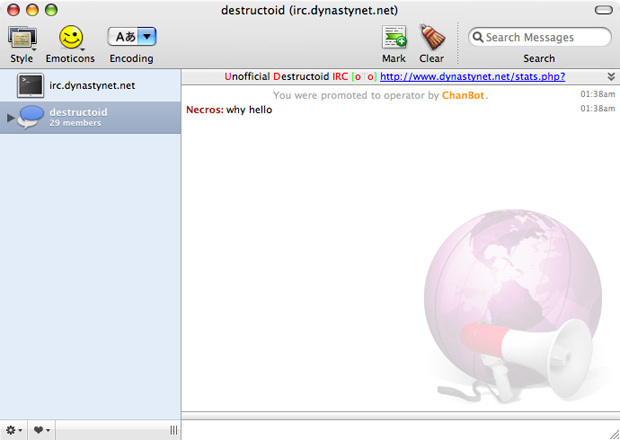 At Auto-connect URLs, click Add... and type irc://irc.dynastynet.net/destructoid. That's it, you're ready to go! Bored in the bus, train or at the airport? 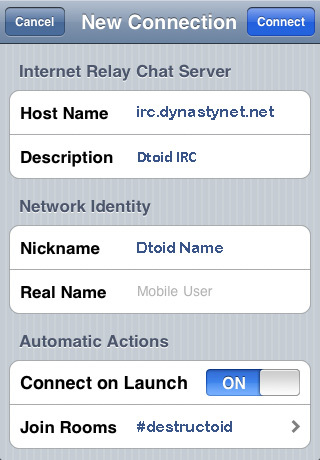 Then just IRC on your iPhone, iPad or Android phone! Colloquy is also available for mobile devices, and should work equally well on the iPhone and iPad. You can grab the app on iTunes or via the official website which has some more info about the app. Unfortunately, it does cost you $1.99. Dtoider TheToiletDuck was helpful enough to provide some info about how to connect. If you literally type in Dtoid Name, something is wrong with you. Leave everything else as default. Once you're connected, go to colloquies > + > room, search for destructoid and add it. That should be all there's to it! Popular Android apps are AndChat and Yaaic, both of which are free! I don't own an Android phone, so I can't really help you out with details on how to connect. Both apps should have a New Connection menu of some sorts though, so just use the above image for Colloquy as a reference. If you can't figure it out, AndChat has a screenshot gallery and the Yaaic site has some shots as well. Or just use any of the other methods to get into IRC and ask around! 3. Politics are something that most people have an opinion about, which you are not likely to change for them. It's not something that is entirely off-limits but if the channel just becomes a politics discussion that the majority doesn't care about, don't be upset if the discussion is "steered" in another direction through various means. 4. If you post NSFW links, please add NSFW next to the link. 5. Don't ask for ops. Other than that, pretty much anything goes as long as the atmosphere remains positive. IRC can go at a lightning speed sometimes, so don't feel insulted if you don't get a response if you say something in the middle of an ongoing discussion. It's easy to overlook lines in IRC so just roll with it. During the UK/Euro daytime, there tend to be more European community members in IRC until the North Americans wake up. The period between the Euro evening to the U.S. evening/night time is when things usually get busier. Feel free to join whenever you like! If you have any specific questions about this guide, feel free to post them in the comments. For anything else, just pop into IRC! Thanks to everyone in IRC who has made it what it is today and a toast to the fallen. May they enjoy their "life"!